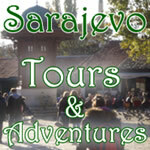 Sarajevo has a good variety of hotels and other private accommodation like rooms, appartments, guesthouses, and B&B's to choose from. Hotels generally run from 35 – 70 euros per night with breakfast included. Most places include sat tv, AC, and mini-bar. The more expensive hotels, 4-5 star, will range from 75-125 euros per night and offer all of the luxuries of western facilities. Many of the older hotels from the socialist era have been renovated and often offer high quality accommodation or on the other hand a cheaper alternative to the more costly modern facilities. The smaller guesthouses and B&B’s have a nice family touch to them. One can often have a nice experience with the owner family, drinking coffee or wine on the terrace with them. Local B&B owners are usually quite friendly and will go out of their way to help you on your trip. There are also several hostels in town that offer cheap beds. We are now in the process of making our own accommodation database. If you want to apply with your own accommodation unit please contact us. Prijavite Vas smjestaj na ovu stranicu. Kontaktirajte nas !